The majority of its export commodities stems from the wealth of oil in the country, but steel manufacturing accounts for 20 percent of the nation’s GDP! Major exports include crude oil, refined petroleum products, natural gas, and chemicals. The capital of Libya is Tripoli. There are approximately 8 million people living here. The official language of Libya is Arabic, with Italian and English spoken widely in all major cities. The majority of the population practices Islam. The time zone is 6 hours ahead of EST. 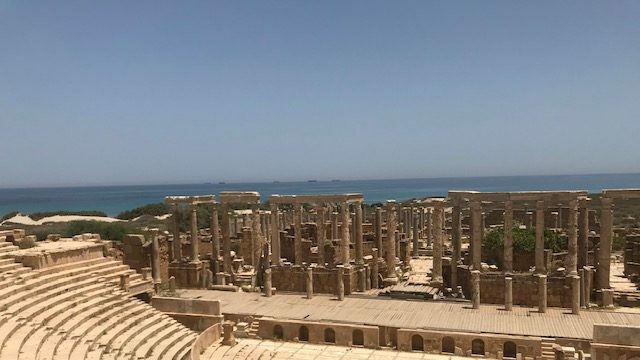 Tourists should visit the ancient Roman empire of Leptis Magna one of the best preserved ruins in the region. History buffs would enjoy the Red Castle Museum which covers over 5,000 years of history up through the Libya’s independence era ending in 1953. This country has a long, distinguished past. The Greeks, the Phoenicians, the Romans (500BC – 500AD), the Byzantine, Arabs, Ottomans, Italians, British, the king, Qaddafi and then the current mess! More on that later. Tripolis, which is what this region was called, meant Tri = three and Polis = city… Which consisted of Sabratha, Oiya and Leptis Magna. What is fascinating about this region is that it was never conquered by the Romans. Tripolis was weary of being conquered by their neighbors Carthage … so they made a pact with Rome: protect us, and we will submit to you. And they did. After the fall of Carthage in the third Punic war, Julius Cesar formally annexed Tripolitania in 46 BC during the pax Romana, the period of peace, and this area prospered. Libya was so important to Rome that a Libyan became the emperor of Rome; his name was Septimus Severus. He built spectacularly and lavishly at Leptis Magna, as evidenced by the wonderful arch, forum and baths. Leptis Magna’s Cardo Maximus ran directly to the Mediterranean, from which you could access the incredible theater. Down the Cardo Maximus (E-W) One could access the exercise facility, where they did gymnastics, wrestling, running, discus throwing and volleyball. After exercise, they go into the hot oil baths, clean off and then go into the sauna, tepid pool and then into the large outdoor pool. These ruins are spectacular, and are perhaps the best in the world! 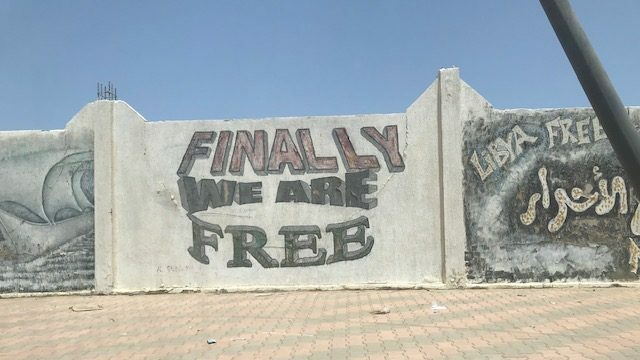 Skipping to the modern era, Libya is a country in transition after the overthrow of Qaddafi in 2011. There are militias in every direction – east, west and south, all vying to be heard and vying for power. The government backed by the UN as a unity government has not consolidated the many factions, and therefore there is still constant conflict. What does all of that mean for the Libyans? Well, just look around Tripoli for answers. 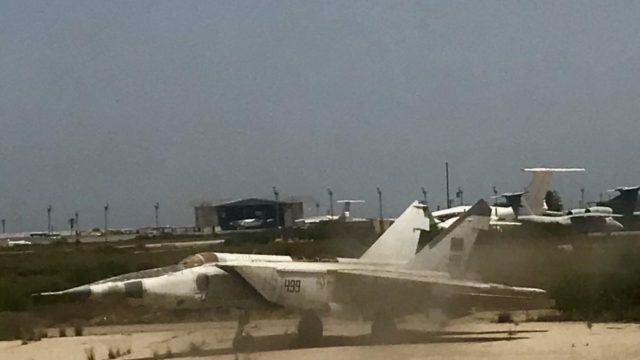 When you fly into Tripoli you use Matiga, a former US airbase. Why? Because the former international airport was bombed. 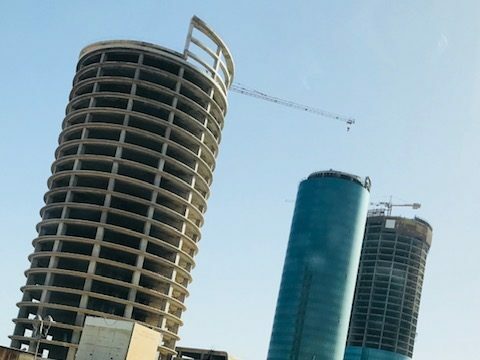 As you drive through Tripoli’s downtown, you’ll see hundreds, perhaps thousands of buildings which have been destroyed or abandoned. Towering office buildings and hotels, half completed, litter the landscape, with cranes attached. Litter lines the beautiful ocean front streets and promenades. The banks are bankrupt, allowing people to only withdraw $40 per day maximum. Trouble is – the lines are so long to get in, the average wait time is two days! The official Dinar to USD bank rate is 1.2 – 1, however on the black market the rate is 6-1. Cash is king here, and I’m referring to the USD and not the Dinar. In the old market, dozens of people trade wheelbarrows full of US dollars! Surprisingly, people here love Donald Trump … and I mean love him. As I walked through the city streets and interacted with people, they shouted “Trump” and gave me a thumbs up or a head nod. I asked my guide why they loved him and he said that Trump makes the fundamentalist tremble with fear, and that they are the enemy of the people. But what you may not know … is that the US has enormous presence in Africa fighting terror on many fronts. 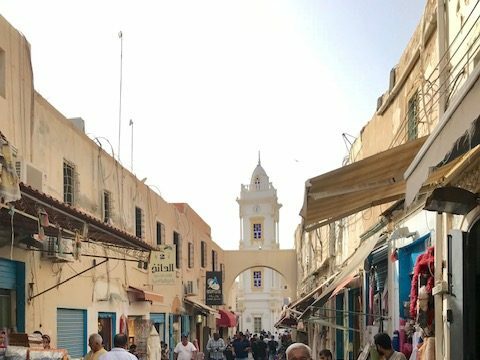 I loved walking through the old markets, and seen the old souks. I felt completely safe the entire time I was in Libya, and no one paid any attention to me. However, I didn’t see any western tourists who looked remotely like me, even at my hotel, the Radisson Blu. Speaking of, this hotel was excellent, even by Western standards, it was clearly the best in Tripoli. By the way if you are a tourist, you can’t stay at the Corinthian. One last point: the airport at Mitiga is fascinating. I have been to ship cemeteries in Africa (in Angola) but have never seen a plane cemetery. There must’ve been 30 or more abandoned, rotting airplanes on the side of the runways! The best was a US Air Force F 14! Lastly, my tour company could not have done a finer job. Ibrahim, Salem and Yousef could not have been more gracious or hospitable.